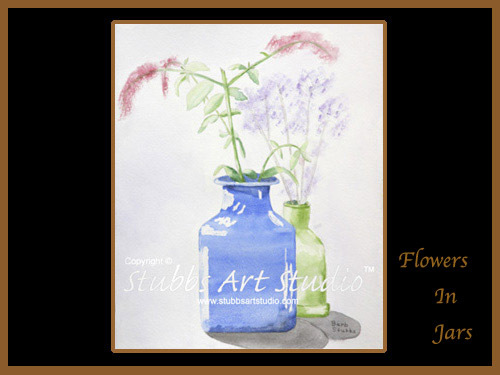 One may look upon this watercolor painting by Barb Stubbs, with soft pastel flowers and coloered glass jars, and think its a simple still life composition. If that's you, take a closer look at the glass jars and how you can see "through" them. Light dances and highlights the back side and illuminates the lightly opaque inner wall to reveal the three dimensional characteristics of these colored glass jars.